The HP-25 started on the drawing board as a scientific calculator with a much larger set of functions than the HP-21. 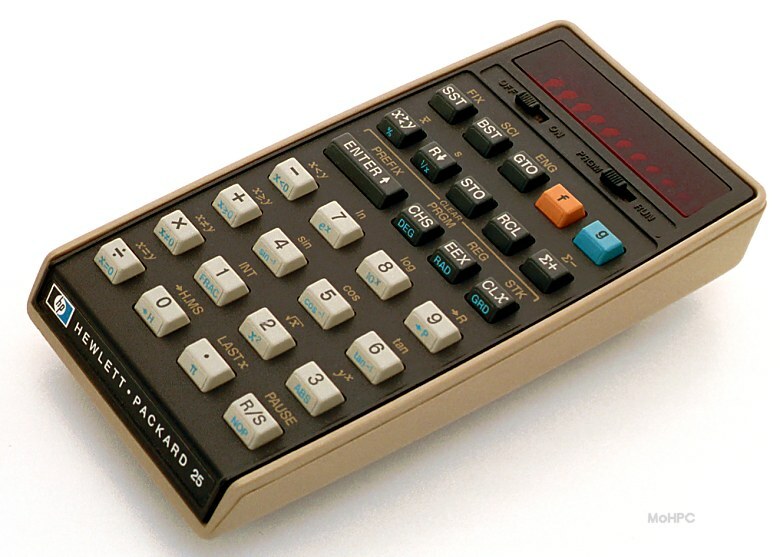 By the time it was done, it was that and it was programmable with 49 lines of memory, making it the least expensive and smallest of HP's programmable calculators. Like the HP-65, the HP-25 caused disbelief in many. It seemed much too small to do so much. Unlike previous programmables, the HP-25 had fully merged key steps... (All multi-keystroke entries like f COS and STO * 2 took a single step.) 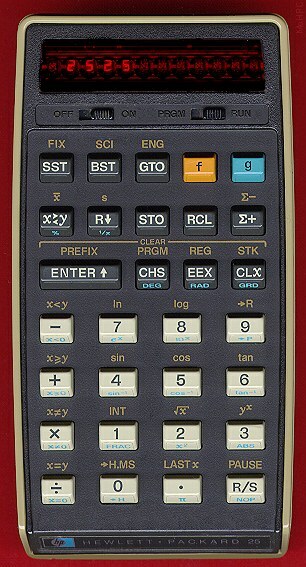 Engineering display mode was also a first on this calculator. The SST key was improved such that when it is held down, it displayed the line and line number about to be executed. When released, it executed the line and displayed the result. The HP-25 came with a 120 page owner's manual printed in four colors, a quick reference guide, and a 161 page book of programs. Sample sheets of HP-25 Program Forms were also included. The owner's handbook had several pictures of the HP-25 against various interesting backdrops including a minicomputer, the Earth and an electronic test bench. Programs supplied included plotting, base conversions, simultaneous equations in two unknowns, mortgage loan, discounted cash flow, great circle navigation, Newton's method solution to f(x)=0, numerical integration, a random number generator, power curve fit, and games including a moon landing simulator. You could do a lot in 49 steps. "If you have worked completely through this handbook, you should have a very good knowledge of all the basic functions of the HP-25. But in fact you've only begun to see the power of the calculator. You'll come to understand it better and appreciate it more as you use the HP-25 daily to solve even the most complex mathematical expressions. At your fingertips you have a tool that was unavailable to Archimedes, Galileo, or Einstein. The only limits to the flexibility of the HP-25 are the limits of your own mind." The HP-25 was the curator's first HP and one of the units he's most attached to. Fortunately, Larry Leinweber has written a java simulation. Price: $195. The price reduced to $145 when the HP-25C was introduced.